These kind of weekends used to only happen twice a year in Miami, during Art Basel and Winter Music Conference. Thanks to SAFE, an underground dance music community based out of Miami, Florida who for the past 5 years has rooted and invested themselves in bringing about underground dance music culture for the benefit and enjoyment of everyone in the community. 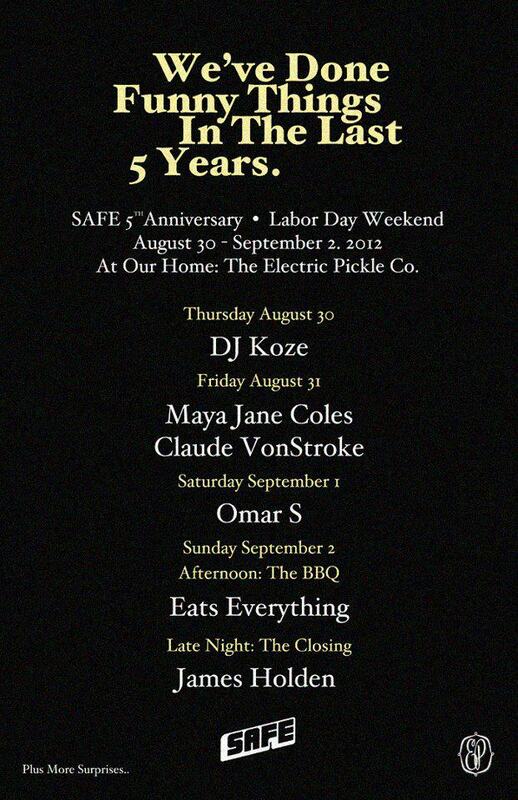 Only fitting that to celebrate their 5 year anniversary they've put together a lineup at The Electric Pickle that delivers some of the most talented DJ's and producers in the world. Definitely has me wondering if I somehow scored a last minute trip to London for the weekend. Everything kicks off tonight with Germany's DJ Koze (get tickets for Thursday night only here). Friday and Saturday will seem like a party within a party, with London's Maya Jane Coles and Detroit / San Francisco Dirtybird records mastermind Claude Von Stroke on Friday (starts early: 6pm), as well as Omar S on Saturday evening. The UK's Eats Everything starts off the Sunday BBQ with James Holden closing everything out late Sunday evening. Stay tuned to OTR next week for a full recap of the weekend's celebration. Purchase your tickets in advance - 4 day all-access bands as well as individual day passes are available, (see individual ticket links below). Don't sleep on this, as each day will most certainly hit capacity and sell out! See everyone this weekend! For set times and other event info click (here).